So you are probably going to have made some judgements about where you are even without knowing it. This is why having a great reception is important for an office. Apart from human interaction, it’s a business’s front line. In this article I shall go over why it is important to have a great reception area and also suggest ways in which you may be able to improve it. Your reception should act the same way as your business card. Someone who walks in should be able to know instantly who the business is and what they are about. For example I was recently visiting a number of JCB sites and in each of their receptions there was a digger / tractor within it. Even if you didn’t know who JCB were you would understand straight away what it is they did within a matter of seconds of being in the reception. Your reception also needs to be welcoming, whilst at the same time a hub of creativity giving the area a personality of its own. The days of dark wooden, singular leather chair receptions are no longer the norm. In a modern day reception the use of continuous soft seating, bold company colours and modern welcoming reception desks bring much more value to the space. The reception along with many things in offices therefore has evolved and is now a place for informal meetings, collaborative brain storms as well as a presentation of company cultures. It’s much more than just a place to meet someone. Receptions on the whole utilise a large amount of space compared to the people that actually use it. Obviously the primary reason for a reception is to welcome visitors. 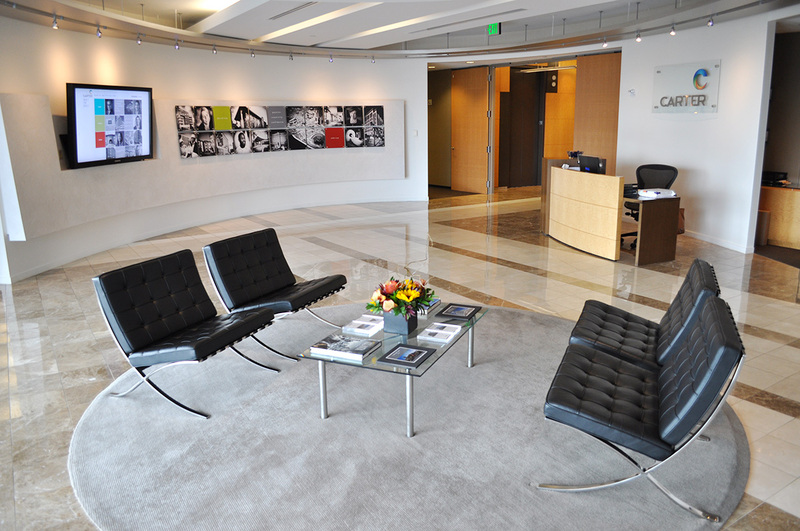 However there are many new products that allow receptions to become meeting and focal points within firms. The introduction of railway carriages , work pods and even hot desks completely transform the reception area. These simple ideas utilise the space in a much more efficient way, without taking away from a receptions primary function. Introducing new technologies such as, smart walls and displays can be a great tool for both giving information quickly to visitors but it also allows the business to change the feel of an environment very quickly by changing colour schemes, lighting and pictures and the click of a button. You can also make your reception area feel more welcoming by including furniture that has in built charging ports for laptops, phones and tablets. It now allows the user, access to a space where they can do research in a friendly atmosphere or hold collaborative meetings, which previously they would of had to of held in a meeting room. It may sound like an obvious improvement. However a lot of firms make a vital error in purchasing a desk that is too big, too small or just pointless for their needs. Decide what you want from your reception space and space plan correctly before choosing your desk. In most cases it will be the biggest and most expensive piece of functional furniture in the room. I have only mentioned a few areas for ideas within this blog. If you would like me to let you know more about how Design Office Consultancy are helping businesses with reception solutions please get in contact.